According to news agency ANI, villagers had spotted the snow leopard in a residential area. Instead of attacking or killing the elusive wildcat, however, villagers decided to capture it and set it free in a more remote area. 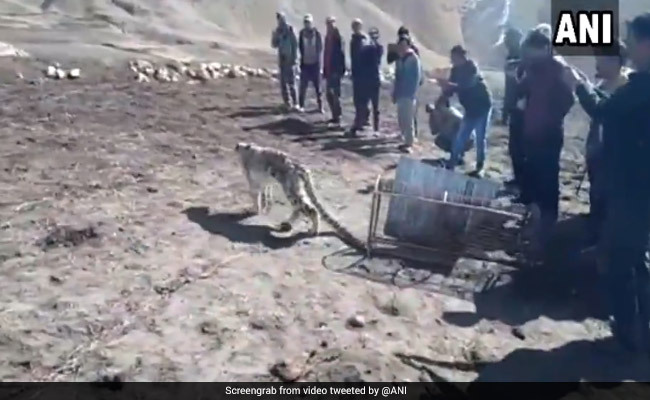 Incredible footage shared by news agency ANI shows villagers from Himachal Pradesh's Spiti Valley setting a snow leopard free after capturing it. The wildcat had reportedly strayed into a village. Snow leopards, often described as elusive, roving, high altitude cats, are rarely sighted. According to ANI, villagers had spotted the snow leopard in a residential area. Instead of attacking or killing the elusive wildcat, however, villagers decided to capture it and set it free in a more remote area. A video, posted on Twitter, shows villagers gathered around a cage containing the snow leopard. Some take selfies, others take pictures of the majestic animal. After some prodding, the snow leopard finally crawls out of the cage and after briefly regarding the humans around it, scurries away. On Twitter, some expressed concern that the villagers were releasing the snow leopard far too close to human settlements. "Errrr... they're releasing the animal in a populated area (see the houses behind?)" tweeted one person. "He's too close to villages still!!" exclaimed another. But most had praise for how the villagers handled the wild animal. "I respect these wonderful people," commented one person on the video. "Nice! Good-hearted people," wrote another. According to WWF, snow leopards, like all big cats, are a Schedule 1 animal under the Wildlife (Protection) Act of India. There are believed to be between 450 to 500 snow leopards in India. According to ANI, there has recently been a rise in the population of snow leopards in Himachal Pradesh. The species, which is found only in high altitude areas, is often hunted for its beautiful, thick and valuable fur and is very tough to spot. Winter Wanderlust: Driving To Spiti And Back!